If you know the Gin Girl, you already know I have an infatuation with overproof gins. Perhaps its something about the larger concentration of botanicals apparent in the higher proof, or maybe its just the grandiose title that Naval Strength signifies when it rolls of the tongue. Regardless, I love it and distillers are picking up on the movement. 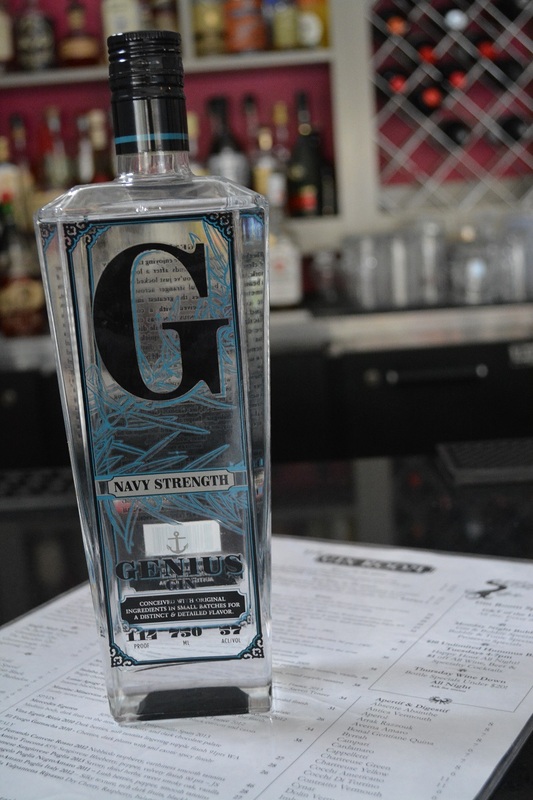 Genius Gin was brought to my attention by a Texas expat and Gin lover, finding solace in The Gin Room and singing the praises of this Austin based navy gin. When it arrived at my doorstep I noticed the intricate decor of the bottle and the three words “Distilled from cane”. I was more than intrigued. I am excited to see that gin distillers are becoming more creative with their choice of base spirit from malty grain based spirits to grape distillation. So I nerded out and found that Texas was one of the 10 largest processors of raw sugar cane in United States. I spoke directly with the distiller and found that their goal was to distill a truly unique neutral spirit, one that was not reminiscent of the GNS that can be readily bought. By making their own choices for yeast, water and sugar, they could tweak the recipe to get their optimal base spirit, one that would serve as a silky base for their specific botanical blend. This gin is definitely unique. The first distinction that caught me was the nose, reminiscent of banana laffy taffy. Yes I said it. Banana laffy taffy from your childhood corner store, getting stuck in your teeth yet you craved it over and over every summer. Notes of pine forest on a cold day and warm coriander round out the aroma. My detection of the cane sugar base is the grainy botanical blend you get in the palate. Coriander, cardamon and a savory lavender on a bolder playground with notes of candied lime and orange to soften the ends in a somewhat Old Tom way. Palate: The 114 proof is evident in this hot naval gin. Grainy notes of coriander, lavender and cardamom with the citrus lime notes lingering. I let the gin breathe for 10 mins and the palate transformed in to warm spices of freshly baked bread glazed with orange marmalade. Try this bold gin with light spicy food and you’re in for a treat. I tried mine with our spicy falafel and boy did it pop! To get its full profile I would recommend serving Genius Naval Strength on a large rock or in a Dolin Dry Martini with a lime twist. Bartenders, this gin is perfect for cutting even the most syrupy cocktails into craft masterpieces. Combine all ingredients in a pint glass filled with ice and stir. Twist and zest a frosted martini glass with the ripe lemon peel and drop in glass. Stir and strain spirit into the lemon spritzed martini glass. © 2019 Natasha's Gin Room. All Rights Reserved. 3200 S. Grand Blvd, Saint Louis, MO 63118.